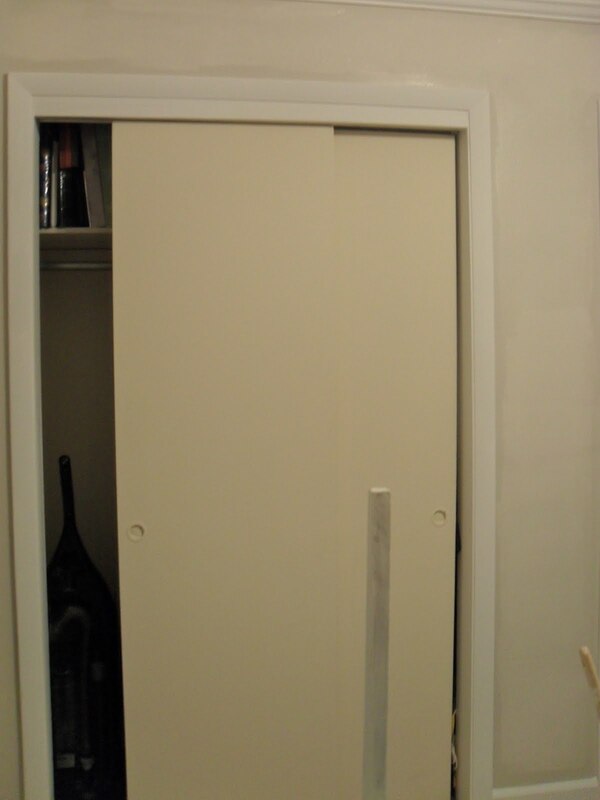 We are back in our guest bedroom today and talking about closet doors. We have a bounty of closet door action going on in that room with almost an entire wall consisting of doors. 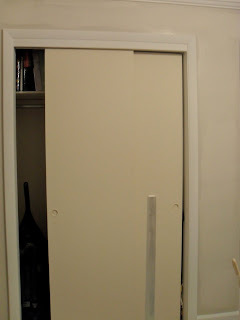 Don't get me wrong, I'm not complaining, I love the added storage space but since the doors take up so much space on this wall I wanted to do something a little different. 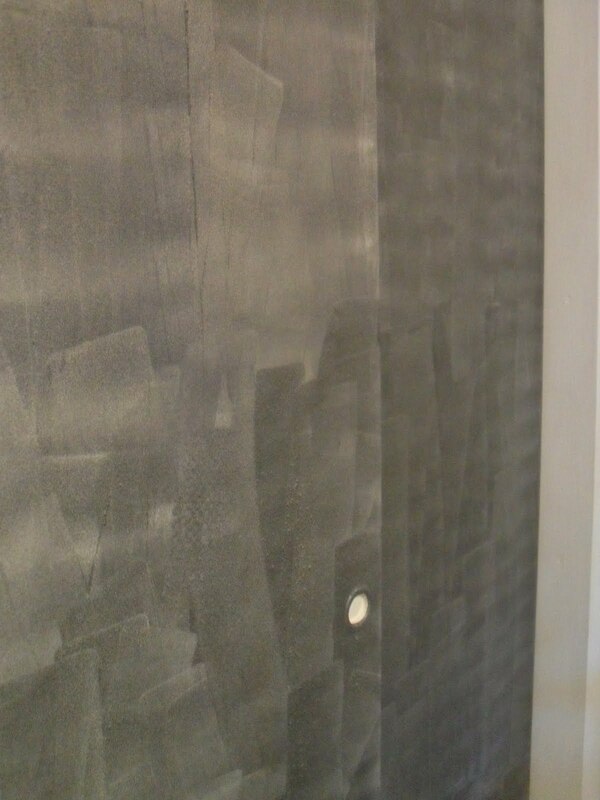 My first thought was to use chalk-board paint, which I did and really loved. Halfway through painting the first doors though I had another idea - to add magnetic paint under the chalkboard paint. Justin and I have a serious magnet collection, we pick up a magnet at any new place we visit, it's just our tradition. We love the memories that our magnets bring us and I thought it would be a great place to have them live. 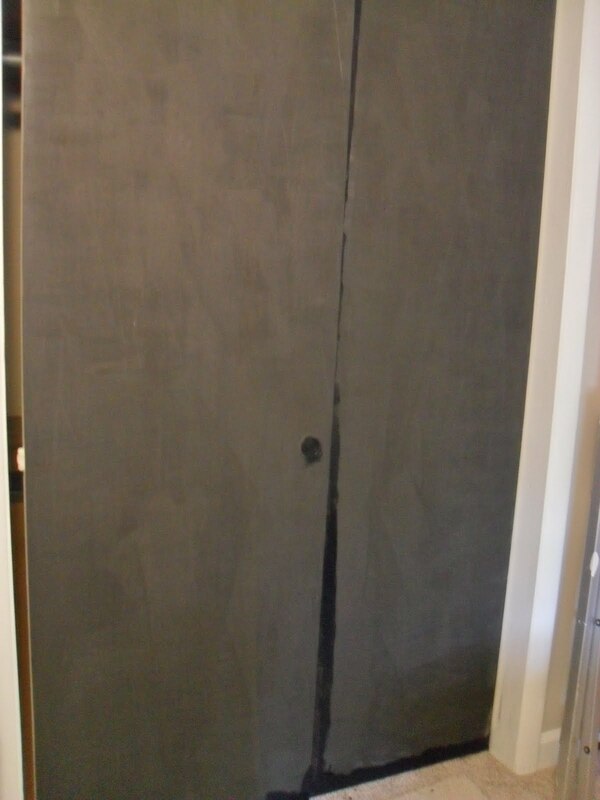 Since I had already started with the chalkboard paint I just decided to do the next set of doors with the magnetic paint underneath the chalkboard paint. So here is where my blonde moment starts to kick in. First I went to the store to pick up my magnetic paint and was quite surprised that it cost $20 for a quart but I really wanted to try it so I went for it. I brought it home, prepped my working space, shook up the can and found that it seemed very light and thin, poured the paint into my tray and got to rolling. 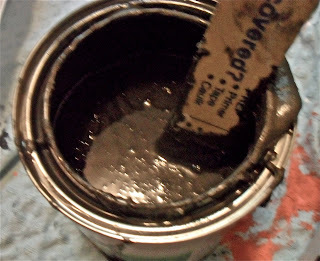 I was very perplexed by the consistency of the paint, it was pure liquid, just like stain (it also smells really bad like stain). I painted the entire first door before I decided to use a paint stirrer to only find that a giant sticky blob of magnetic paint had settled on the bottom of the can and I was only painting with liquid residue. Haha! I felt ridiculous. 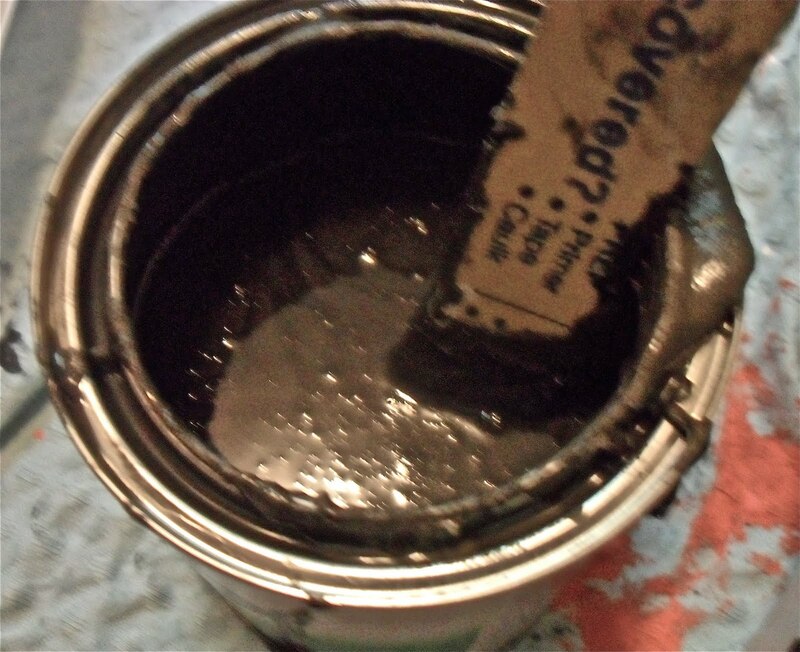 I will say, this stuff is almost impossible to stir up and I was totally wishing I had thought to have the store shake up my paint before bringing it home - and I will always do that from now on when buying paint off the shelf. Here's a picture of my first attempt. I mixed and mixed and stirred and shook the best I could to get this stuff right. I honestly have no idea what the consistency of this paint is supposed to look like but mine ended up very thick and sticky. It was really hard to paint with but I managed and got three more thin coats applied (the directions read to apply three thin coats instead of two thick ones). Here's my final magnetic paint job (plus a little chalk board trim paint that I started because I almost forgot to get a picture). I have no idea if this is actually going to work and if anything will hold magnetically to these doors. We might only get the lighter magnets to work but I do think it will be a fun place for Silas to play at one day. It was a good idea in theory but ended up being a lot more complicated - mostly due to user error. 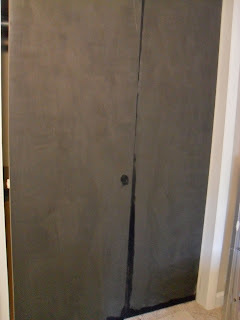 All in all, I do love the way the doors are turning out especially with the chalkboard paint on top. My final coat is drying right now as I type so I will get the final pictures up this week- stay tuned. I truely don't know how you are getting all this done AND taking care of a very active 9 month old. I'm with Betsy. There's no way on God's glorious green Earth that I can ever get anything accomplished with two kids underfoot. Wow can't wait to see it all finished!!! -I just have to do it in stages during Silas' naps and at night after he goes to sleep. He might not go down to sleep for a nap that easily but once he's out, he takes a really good nap. -Kylie, I can't wait until it's finished, haha!